The team of Surya Nepal and Change Fusion Nepal worked for months, starting from 19 December 2013, the opening date for applications, to get to the five winners for this year’s SNASEA. 119 applications came in from around the country within a month, and forty applications among them were short listed. The shortlisted applications presented their ventures in ‘The Bazaar’ held on 1 March at the Embassy Restaurant at Pani Pokhari. The applications were then evaluated by a panel of judges, who came up with the ten finalists. Field visits were made, and reality tests were done. And on the day, five winners were announced, selected on the basis of merit of the person, as well as, the project’s. Grit, vision and passion were the measures in which the entrepreneurs were judged. The ventures were judged on the basis of social issue it addressed, and its financial sustainability. The gala event was attended by both local and international luminaries. 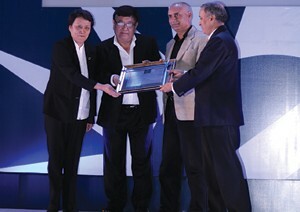 The third SNASEA (2013) was dedicated to Dr. Sanduk Ruit (Tilganga Institute of Opthalmology), whose efforts in providing affordable and quality eye care services for individuals in Nepal and other parts Asia has been an inspiration to many. Having witnessed the arduous effort that is put into gathering firewood to cook food, and the health effects of household chulos in villages, Madhukar KC worked for over a decade to come up with a new chulo that would address these problems. Inspired by instrument used by goldsmiths to melt gold, KC came up with Matribhumi Chulo, which now reduces the amount of wood consumed by seventy per cent, and cooking time by sixty per cent. And with these apparent benefits, Matribhumi Chulo is now used in several villages around the country. After watching a television report, Prem Bahadur Lama was motivated to try organic produce to tackle his arthritis. The recovery that followed, led him to spread the word on the benefits of organic produce. For the past twelve years, he has been working to promote organic farming, through trainings and partnerships with farmers from nine districts. His efforts has helped increase returns to farmers, as well as, to promote organic farming and healthy eating. Fulmaya Tamang did not agree with the submissive nature of women in her community. She convinced twenty women to start a women’s group in her village, starting with only Rs. 50 per month from each. Together, they established an informal savings account, and started providing low-interest loans for buffalo husbandry, vegetable farming and other small ventures. They also started focusing on children’s education. Today, there are 400 members in the cooperative, including men, and has been able to help fifty families in the community. Sunita Nhemaphuki started an agriculture based magazine – Krishak ra Prabidhi, with the objective of improved information flow between the farmers and the market. The organization has also initiated Krishi Club, a practical information center and platform for farmers to share and network. Every week, the club invites farmers from different regions and sectors to share information and to network. The venture is also looking to develop a mobile application for farmers and establishing an agricultural library in villages. Rabbit meat is not only a culinary delight but also has high nutritional value and protein content. As rabbits are one of the most prolific breeders in the animal kingdom, rabbit meat production has the potential to be a lucrative venture for farmers. With this idea in mind, Ujjwal Chapagain had set out to demonstrate and advise farmers of the benefits of rabbit farming. Till date, the venture has been able to train over a hundred farmers, of whom eighty are already providing for their family with rabbit meat production. Having faced the water woes of Kathmandu himself, Suman Shakya, along with Tyler McMahon, started SmartPaani to offer a smart solution to the problem. With their venture, SmartPaani, the two introduced rain water harvesting, a new sustainable source of water, for Kathmandu-dwellers. Systems provided by Smart Paani also include grey water recycling and water filteration systems. The team is also working to raise public awareness and direct the government’s focus towards sustainable means to meet increasing demand for water. The venture started with an initial investment of Rs. 6,000. Producing accessories made from felt fabric, the venture was soon able to find international buyers for their creative products. Today, Friend Handicraft provides employment for over hundred women from low-income households, providing safe working condition, and education scholarship for their children. 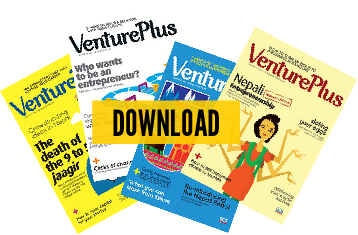 The venture is an example of a combined effort between the community and a private firm. Working to extract, collect and sell resin from pine tree sap, the venture uses the revenue for forest conservation, to uplift the local marginalized communities, and to conduct other community development activities. Similar models have been replicated in community forests in Ramechhap for Lokta paper production. The cooperative provides financial and technical support to persons with disabilities. With the focus on income generation through vocational training and micro loans, the organization has been able to involve over two hundred households in various activities. The fifteen year old organization also advocates for the rights of people with disabilities at the policy level. Coming from a family of farmers, Dipak Prasad was well aware of the hardships of farmers from Sindhuli. To tackle the problems of unscrupulous middle men and inaccess to market, Koirala started a co-operative to help junar(sweet orange) farmers of the region. Today, the co-operative represents seven thousand five hundred households, forty eight local level co-operatives, two district level co-operatives and one central umbrella organization.